Since 1984 the farm has continuously developed and purpose built units are replacing old buildings. Lands were purchased in 1994, 2007 and 2016. Over the years, the farmed area was further increased by renting land. Currently 150 acres of land are being farmed. A bespoke herd of shorthorn cattle has been built up. 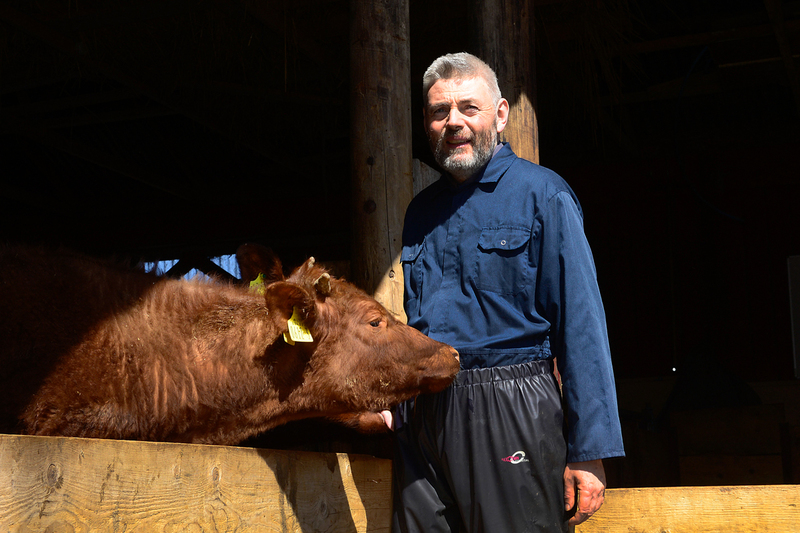 Fundraising has enabled us to build a new hay dryer and social farming cattle barn.
" What type of social forms do we have to create so that the earth, the farm and the animals are healed? There is nothing more important than this. This is of the foremost importance. There should not be the necessity for any one person having to work alone on the farm without the possibility of meeting others doing their work. The task is to create suitable social, life forms for people in which the earth, plants and animals are brought in to a harmonious relationship. On a farm where this is made possible by the people, the soil will start to change, animal health will improve and plants will grow differently. These are the conditions under which harmonious life forms can be established." Modern farm machinery gives us the capability to grow and farm a variety of crops, under the sometimes challenging weather conditions of this area. The farm is a mixed biodynamic enterprise, Demeter certified since 1994. Its aim is to produce a broad variety of food mainly to supply to the 80 people living on site. The running of the farm is done in teamwork, which includes adults with learning disabilities. Crops grown include mixed field vegetables, oats, rye and a brassica mix for late grazing. Grass and barn dried hay provide the main feed source for our cattle; milk is processed into butter and yoghurt. The manifold activities provide ideal training possibilities for students with an interest in the biodynamic way of organic farming. Hi, my name is Seamus Mc Crossan. I have been work coordinator on the farm at Camphill Community Clanabogan since December 2016. After a widely varied career in catering as a chef, later as a tree surgeon and a farming upbringing I feel I fit in well on this social Demeter farm and have a lot to offer as well as a lot of skills to share. The team ethos is very strong at Camphill both within the farm and the wider community with lots of opportunities and challenges to keep everyone interested, from our residents with learning difficulties, international volunteers and staff. It is a fantastic environment for everyone to learn, grow and connect with nature with a wide variety of tasks for everyone to get involved in.